Can't Get Enough of it Quinoa Recipe! I have to go to class but I wanted to post the ingredients for this recipe before I forgot them. I ate this for lunch and it tasted AMAZING. Will post more later. Right now I should really be memorizing definitions, practicing balance sheets, and journalizing entries for Accounting...however, I need a little break so I'm going to post a recipe for a yummy little something I ate yesterday for lunch! Saute sliced onions on medium heat in 1/2 tsp. olive oil until golden brown. Add green beans and garlic and allow them to get some brown marks. Cut up chicken into bite size pieces and add to onion/green bean/garlic mixture. Heat chicken through. Take mixture off of burner and plate. Sprinkle cheese and basil on top. Add s&p to taste. For maximum enjoyment: eat this SOMEthing out of NOthing recipe on a cool autumn night with a slice of garlic bread! So I basically just want to write out a bunch of recipes that I have been enjoying in the last couple of weeks. They are random and somewhat strange but at least I will have a record of the things I like. Directions: Saute' carrots, celery, onions, cabbage, and garlic together for about 5 minutes on a medium heat. Add rosemary, cumin, sage, and thyme. Turn the temperature up to high and add chicken broth. Let simmer for 3 minutes. Add cooked black beans, chipotle adobo sauce, lemon juice, Tabasco sauce, and salt (pepper optional). Once heated, plate it (or bowl it :P), and enjoy! Will post more later! Off to class! So lately I have been trying to eat more dairy. I am not a huge dairy lover. I am not a huge fan of the calorie and fat content in dairy as well. However, cutting out dairy completely from my diet has kind of been my pattern for the last few months. This probably hasn't been the wisest decision because I don't want my body to freak out when I eat dairy because I practically never eat it (does that make sense?). Since I am on this whole "health kick", I decided that I don't want to introduce my body to dairy again through drinking straight milk and eating tons of cheese. Somehow I feel like eating yogurt is healthier (maybe because the yogurt my mom buys is organic?). So I have been eating bits and pieces or more like spoonfuls and globs of yogurt here and there. 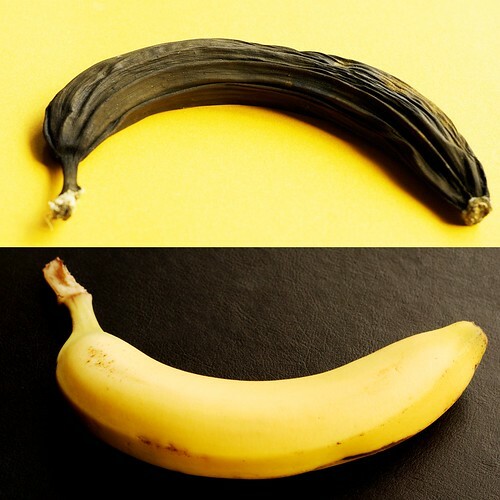 One night we had a sad banana that had been cut into that day and hadn't been finished. The browning stages were well under way and I didn't really feel like eating the browning banana in that state. I had already eaten dinner and was wanting something sweet yet "healthy" to eat. I was also craving peanut butter at this time (when am I not craving peanut butter?!?). The combo of trying to eat yogurt, wanting to use up the browning banana, and fulfilling my dessert and p.b. craving helped me to create this little something out of nothing dessert! Blend top 3 ingredients together and pour into a cute little ice cream dish. Pop into freezer for one hour and viola'!!!!! If you want to add a little extra somethin' somethin' add some chocolate (in whatever form you choose) on the top! Enjoy this simple, delicious, and somewhat nutritious dessert! The last time I posted, I wrote about how I could possibly be working in the kitchens at the golf course where I work. Well, I spoke with the executive chef, Dan, and my culinary dreams were given a reality check. First of all, on Sunday, a friend who recently graduated with a culinary certification explained to me what cooking in a kitchen is really like. Even though I believed everything she said I still wasn't sure if it would be as bad as she said it was. I talked to Dan the next day and he kind of gave me the low down on making cooking my profession. I greatly appreciated his honesty and his genuine concern about my future and the choices I made concerning the culinary arts. After I spoke with him I was extremely confused about what I wanted to do. He offered my a job in his kitchen for 16 hours a week and no less. Unfortunately, because I am taking 17 credit hours, I had to turn down the opportunity due to such a busy schedule already. Even though I can work in the kitchens next summer, I am still unsure if I really want to. Dan, the head chef, really wants to hire people who have a desire to go to culinary school. After I spoke with him, I wasn't sure about spending thousands of dollars to get a culinary arts degree, just to get paid 8 dollars an hour. On top of the low pay, chefs have to work an average of 10-15 days in a row and way over 40 hours a week. He basically told me that if I want to have a life outside of work, don't go into the culinary arts. Even though he was so blunt about the reality of becoming a chef, he was still understanding and encouraging concerning my desire to cook. He encouraged me to try it out and even go to culinary school for a learning experience rather than for a job. I still don't know what I am going to do next summer. Or for the rest of my life. But I know that it will all work out. And one thing I do know is that I can always enjoy cooking. If it's in the comfort of my own home or in a professional kitchen, I can still enjoy the pleasures of cooking! My new favorite thing: warm salads. YUM. I have only made a couple in the last couple weeks but I am enjoying them thoroughly. The other day I made a spinach, apple, and onion warm salad. The NOthing Inspiration: I had eaten half of an apple that morning for breakfast and there was a leftover quarter of an onion. I saw both of these things in the refrigerator and was wanting something fresh yet warm to eat. I wanted to use up the apple before it got brown and I adore onions. Even though apples and onions seem like a weird combo, I love how they compliment each other. Apples are sweet and tart. Onions are..well...oniony and sweet when sauteed. It sounded like a good combo so I got started on my creation. After slicing the apples, onions, and spinach, add the diced apples to a small skillet with the olive oil. Let apples saute for about 2 minutes and then add the onions. When the onions and apples are browned and softened up (but still have a bit of a crunch), add the spinach. Stir frequently and add the rest of the ingredients. Serve with a broiled corn tortilla that is seasoned with garlic, salt, lemon pepper, and ground black pepper. Enjoy this SOMEthing made out of NOthing warm salad on a warm summer night with a glass of iced tea! Day one of blogging for food lovers! On this first day of blogging, the reality of cooking as an occupation started to become a reality. I talked to the head chef at Castle Pines Golf Course about the possibility of cooking in the kitchens this fall. As I entered the kitchen to talk with him, a rush of excitement (and apprehension) came over me. I saw the hustle and bustle of chefs running around the kitchen toiling over scrumptious dishes which would soon make a rich golfer happy! Even though the head chef believed that I could work in the kitchens in the fall, I somewhat became hesitant to accept that I might be making my, off and on, dream a reality. I know that cooking in a kitchen for a golf course is not the apex of a culinary career, but the idea of making food for others (besides my wonderful victims i.e my family) was near in sight. We will see what becomes of it. Until then I am going to continue to enjoy making food in my mother's kitchen! Food bite of the day: My co-worker, Julie, brought stuffed peppers for lunch yesterday. Today I asked her what was inside because it almost looked like a Mexican style stuffed pepper. She told me the regular ingredients that a stuffed pepper would contain. But she also added corn to the meat mixture that goes inside the pepper. Then we both came to the conclusion that lots of things could go into a stuffed pepper! 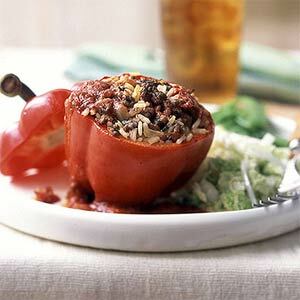 The fun thing about stuffed peppers is the creativity that can be used during the making of this delicious meal. I think you could take several differant flavor combos and stuff them into the edible containers. Italian: What about a beef, mushroom, garlic, onion, artichoke, and parmiagano reggiano stuffed pepper? Mexican: A beef, corn, salsa, sour cream, green onion, chipotle peppers in adobo sauce, and garlic stuffed pepper? Oriental: Or what about a vegetarian style pepper including rice, peas, corn, water chestnuts, and a sesame seed oriental dressing stuffed pepper? So many options! I am really in the mood to try all these different combos! The best part about it is that you can use whatever ingredients you have in order to make something delicious and scrumptious out of nothing!